Deluxe Materials has announced the release of three new products for 2016! Plastic model kits are typically composed of intricate parts and various materials and often require joining in tight inaccessible places, presenting a formidable challenge even to the experienced modeller. Deluxe Materials’ Plastic Magic is now available in a beautiful, new, sturdy, anti-spill bottle with fine point applicator brush cap. In addition there is also a finer long reach brush for joints in tight areas and which allows access to every last drop of adhesive in the bottle. Plastic Magic, super thin adhesive will deliver invisible joints to a wide range of plastics using its high solvent power and rapid capillary action. 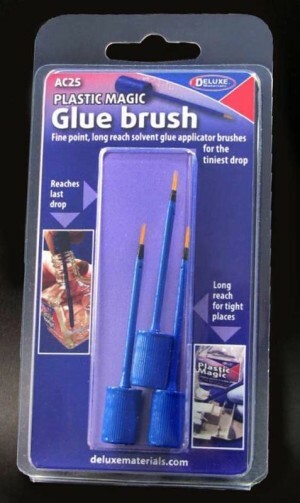 It is also designed to deliver rapid adhesion and longer lasting action when applied with the fine point applicator brush or the unique, finer longer reach brush. Plastic Magic bonds: Styrene, ABS, Polyester PVC, Butyrate, Polycarbonate, Plastic Card with a long lasting, clean, non clog action. Boxed with the two unique brushes, the stable 40ml bottle is a natural and safer choice for any work bench. Plastic modelling made easier; please ask for Plastic Magic for your next project. Choice of 2 brushes with high precision and long reach. Reaches the last drop in the bottle- no waste. The 40ml bottle of Brush Magic (part number AD77) is priced at around £5.99 and distributed to all good hobby shops through our international network of distributors. have good hold to allow teasing around corners. be repositionable without sticking to fingers. allow application of both wet or dry tissue. allow sliding of tissue into position without wrinkles. dry quickly without dis-colouring tissue. accept cellulose and Eze Dope. be stable during water shrinking & doping. Deluxe Materials New Formula Tissue paste is all of the above. Deluxe Materials Tissue Paste for! Strong hold all types of model tissue. A 50ml bottle of New Formula Tissue Paste (AD 60) is priced at £5.75 incl vat and is distributed to the trade by our network of distributors. 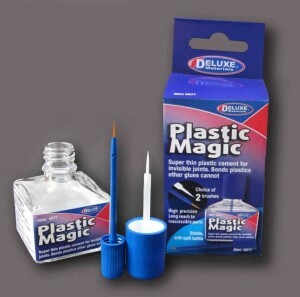 Enter the Deluxe Materials Plastic Magic Glue Brush pack. These specially designed, superfine, long reach brushes will deliver the tiniest drop of solvent adhesive even to difficult joints. The pack of 3 brushes specially designed for application of Plastic Magic to small scale tiny parts is priced at £3.75 incl vat and is distributed to the trade by our network of distributors.